Now you can use the same great software platform that customers have used for years to monitor their TicTocTrack watches, to monitor mobile devices. Simply download the TicTocPhone app onto the device you wish to monitor and if you aren’t already a customer download the TicTocTrack monitoring app and register as a user. 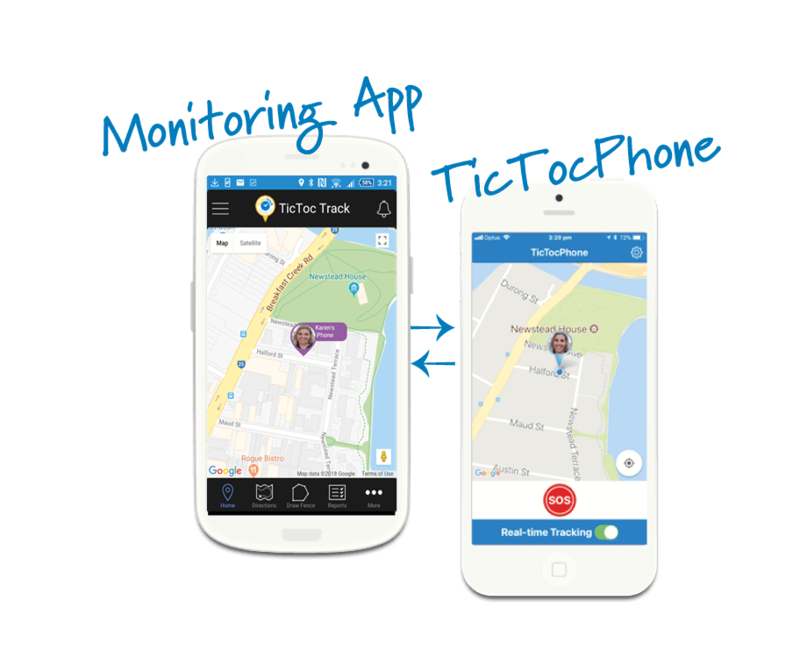 Once you have paired the device with TicTocTrack you can monitor your loved ones mobile phone the same way you can your child’s TicTocTrack watch. Set up safe areas, receive alerts when they enter or exit and monitor their movements in real time with our ‘real time tracking’ feature for times when safety is a concern such as walking home at night from the bus stop. The handy SOS alert allows them to let you know if they need help and for Android users take advantage of our ‘sudden movement’ alert which automatically activates the SOS when the phone receives a sudden shake. *7 day free trial with no lock in contracts. Monthly cost reduces the more devices you add. If you are new to TicTocTrack before you can monitor a mobile device you will need to download our monitoring app and create a user profile. You will then be able to add the device you wish to monitor. Once the person has added your phone to their monitoring app your will receive an SMS to pair your device and give permission for them to monitor your location. To pair your device with the monitoring app download TicTocPhone and follow the simple set up instructions.